Solar thermal heating for domestic hot water is the fastest growing renewable technology across Europe. Using radiation from the sun, a sophisticated solar collector is used to transfer the maximum amount of energy possible in to a fluid, which runs through the collector and which is then used to indirectly heat water in a storage cylinder. As solar thermal technology does not rely on sunlight but on solar radiation, it can work as efficiently in our climate to provide up to 70% of annual domestic hot water requirements. Using the sun as a renewable energy source helps the environment, leads to reduced energy bills and means less reliance on gas and electricity for water heating. 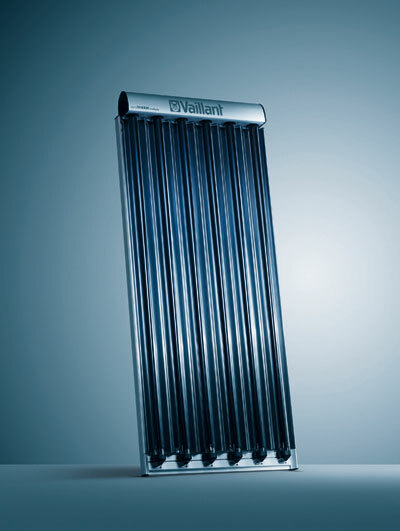 Vaillant's range of highly effcient solar collectors have been designed to give maximum energy absorption and are easy to install in various applications. As the panels work on diffused solar radiation as well as direct sunlight,they will even generate small amounts of energy on partially cloudy days. Multiple panels can easily be fitted together as required for larger systems.